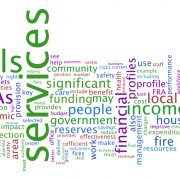 The Value for Money (VFM) profiles bring together data about the costs, performance and activity of local councils and fire and rescue authorities. The data are displayed under sections that give an overview of the chosen organisation and the services it delivers. The VFM profiles use data supplied by councils and fire and rescue authorities. They can be used by anyone who has an interest in local public services including service users and residents. To enter the profiles select an organisation to view using the search box above.